The first crucial step in any successful exterior painting job is Pressure Washing. This stage ensures proper paint adhesion by removing dirt and any loose paint from the surface. Following the best preparation practices and using high quality products will add years to the life of your paint project while protecting your investment. The ﻿Cleveland Painting Contractors﻿, D&D Painting offer complete Painting Services including Interior Painting to brighten your home, Exterior Painting to add curb appeal, and Gutter Cleaning to keep your home safe and clean. View our recent Customers Testimonials, and receive answers to your questions on our FAQ page. We perform pressure washing all the time for our customers. There are actually several good reasons for having a good pressure wash. Probably the most common pressure washing we do is when we are about to paint a residential exterior of a house. Over time, your house becomes dirtier and dirtier. Oh, you may not even notice it because overall the house looks fine. But if you looked closely, you would see that the house has become covered with particles of dirt and grime. Rain droplets that are carrying dirt and splashing onto virtually every square inch of the house can really spread the dirt around. Not many people realize that rain is not just clean water – that’s why your car gets cleaner by going through the car wash than by just sitting in the rain. Pressure washing takes care of all of those things before painting. The surface has to be clear of all contaminants so that the primer and the paint are able to adhere well. Otherwise you will be painting again much sooner than you want to. Surface preparation by pressure washing really pays off in the long run. D&D Painting also performs pressure washing on decks. Some people might not think it is necessary to use high water pressure for this, but your deck is subject to the same variety of contaminants as the rest of your house. Just spraying it with your garden hose and sweeping it occasionally with a broom is not enough to get rid of the dirt that accumulates in the surface. 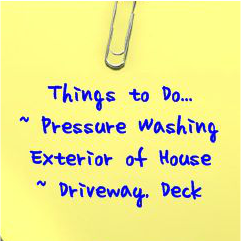 In fact, you will probably be surprised at the appearance of your deck after we have pressure washed it! Vinyl siding also has a greatly improved appearance after a good washing under pressure. Sometimes we will come out just to pressure wash the exterior of a house with vinyl siding. Obviously, this is not to prepare it for painting, since vinyl siding virtually never needs to be painted. The purpose of that wash is just to improve the appearance, and it definitely does that. Some customers are quite surprised at the difference. Since the accumulation of dirt takes place over time, and you see your house every day, you don’t really notice it much until all the dirt is gone. Contact us today for a Free in home Estimate and Color Consultation. View our updated Painting Blog as we go out on the job.